Holiday nail art is not a new trend; every holiday is represented with a lot of trendy and on themed nail options, but there are few categories that can compete with the number of Christmas nail designs. 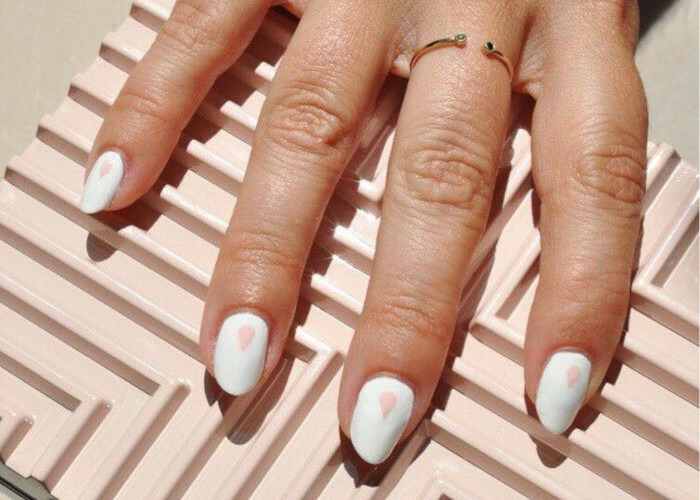 Nail art in general is completely amazing and another way to perfectly accessorize a look. While many people do have the imagination to create a look on their own, it doesn’t hurt to have a bit of inspiration to guide you (or your nail tech) into creating the perfect holiday nail art design for the upcoming parties. Many of these holiday nail designs are actually pre-designed nail sets that you can order to wear later. Some of the holiday nail art ideas and designs are the kind you can do at home, or you can ask your friend with the steady hands to help you with if you are brave. 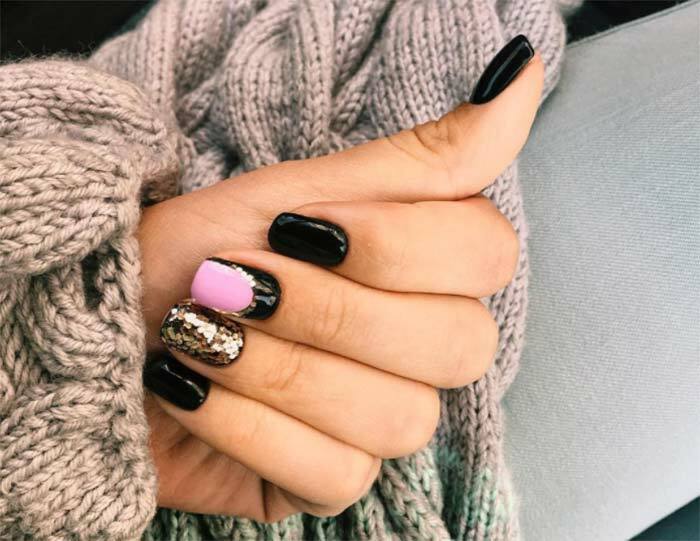 Either way, it is incredibly convenient to be able to purchase the perfect holiday nails for an upcoming party or even just a few to wear during the entire season. Many of the holiday nail designs in the following list can be purchased and worn whenever you are ready, but any of them can be used for inspiration at any moment you choose. Happy Holidays! Hologram style snowflakes thanks to meticulously applied holofoil and decals and little gem accents really offset the holiday matte nearly poinsettia red. The offset color painted ring finger nail is done in stark white to let the red design around the holofoil snowflake really mesh with the overall holiday nail design. 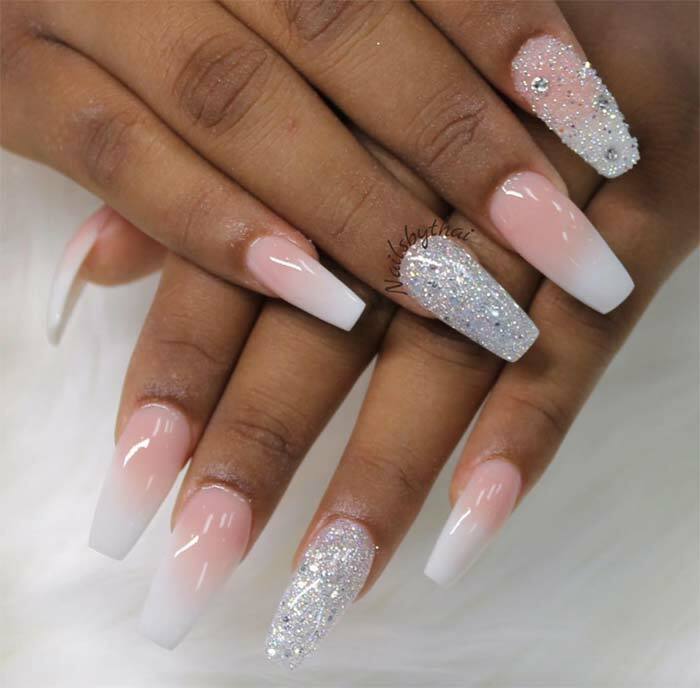 A great nail set should work on their own and stand great with any look and these sparkly soft pink holiday nails can do that. 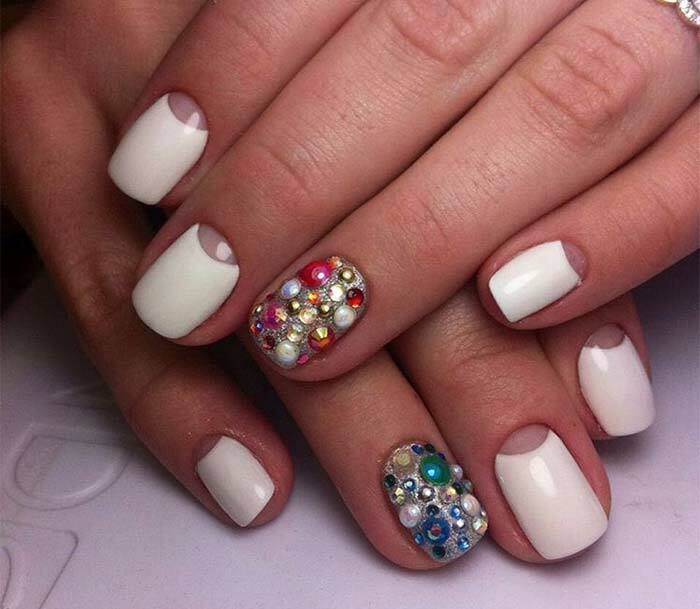 The subtle sparkle of the nails looks fantastic and stiletto nails are incredibly high on the current trend list. 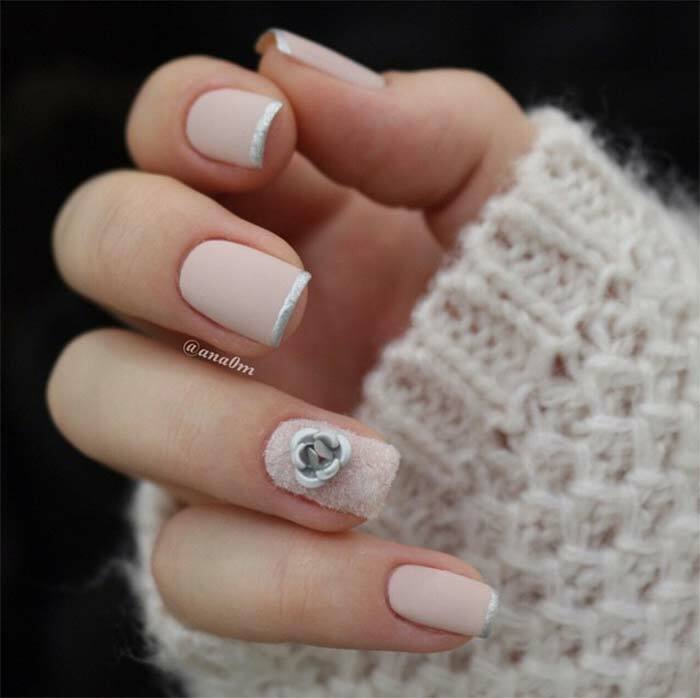 Matte tan nail color with a fine silver tint is subtle and aesthetically interesting, but the stand out feature of this holiday nail design is on the ring finger nail. The textured nail is in the same color and supports a three-dimensional rose decal. In this holiday nail design, every nail has a different design, held on theme by the interesting take on a monochromatic color scheme. 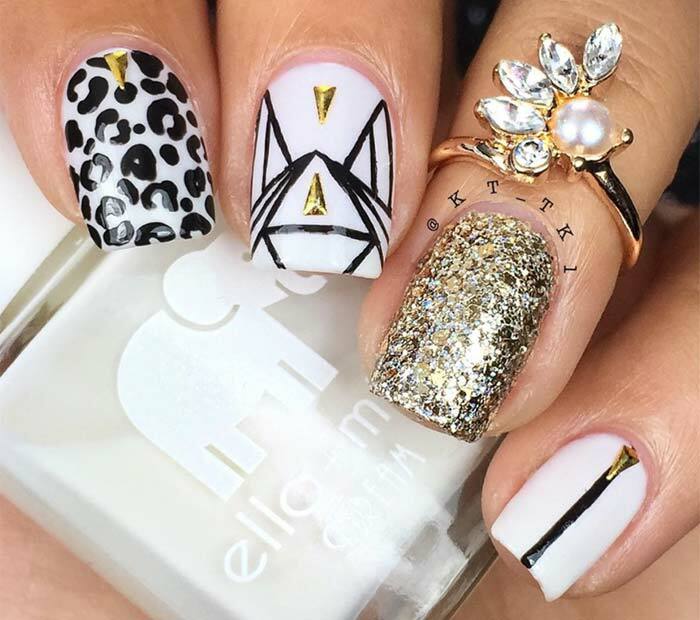 The gold three-dimensional details are used in several ways to keep the aesthetic interesting across the manicured nail set and the silver glitter nail color (check out how to apply glitter nail polish correctly) works well with the shine of the black and white designs. 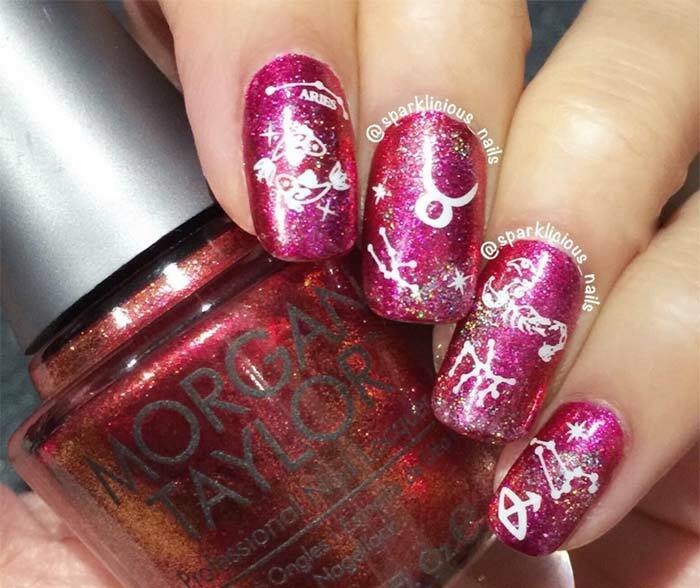 As if ombre nails are not cool enough, this holiday nail design uses a glitter ombre with painted Christmas ornaments on each nail. 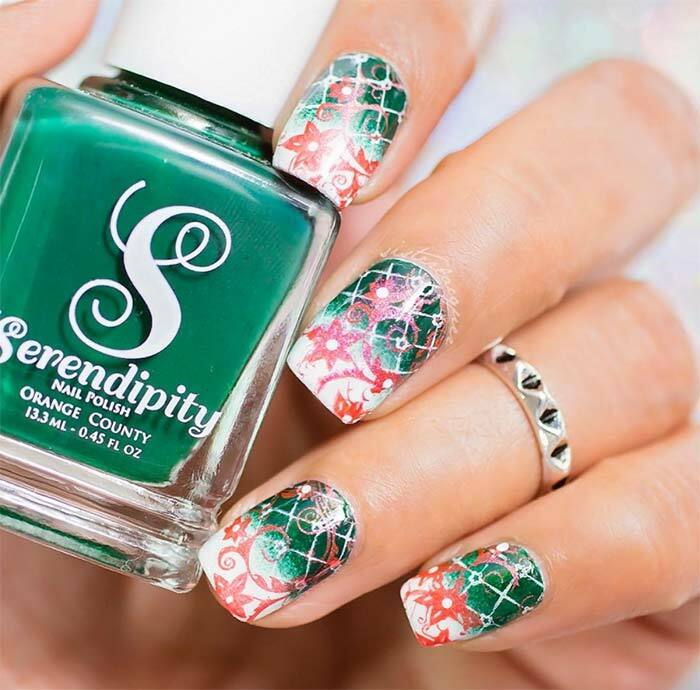 The look is intricate and fun with a design that is obviously designed to be holiday nail art with a definite cheery holiday appeal. Shine bright like a diamond is a lot of people’s favorite line and lots of credit to Rihanna for letting us play that song like a mantra to boost our day. Now we can wear homage to the line and the thought by having it painted as a holiday nail art. Silver with rainbow sparkle is nearly expected during the holidays, but honestly, this would look great year long. 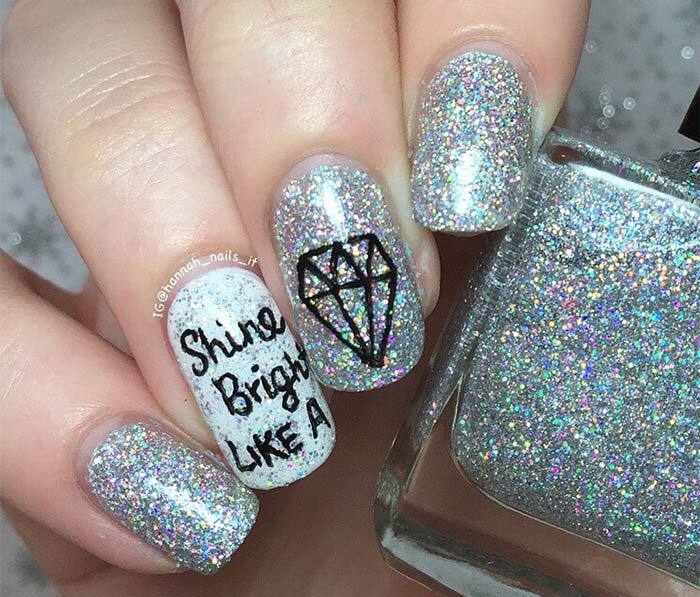 White is a great background to make colors pop, but the addition of sparkling three-dimensional stones gives these Christmas nails a stunning focal point. This holiday nail design is interesting enough to be a great conversation starter. Gray is such an underrated color that provides such an interesting contrast against others. 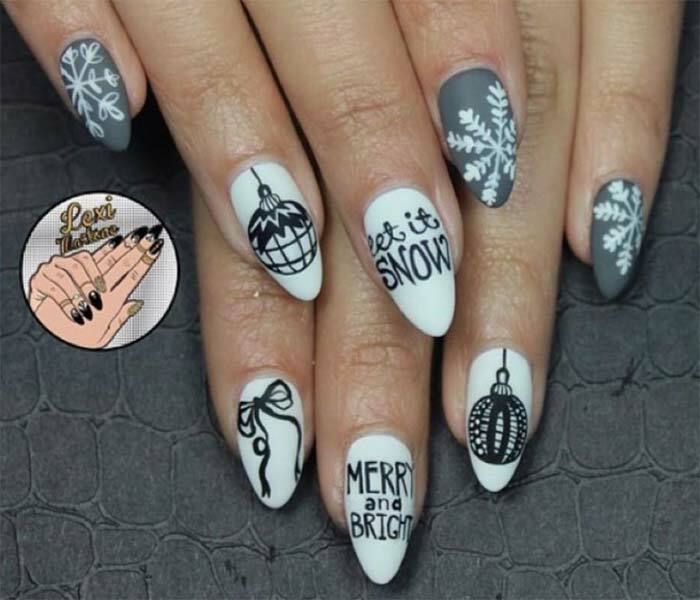 Here the matte grey is a stunning background for white snowflakes and matte white boosts the black ornaments and Christmas holiday slogans for a perfect holiday nail design. Celebrate the holidays with a cute Christmas nail design and a classic pinup on your center nail. The design is clean cut, but interesting with classic little pearls and gold beads. The entire design is visually interesting and the multi-textured details add a lot of interest to the look. 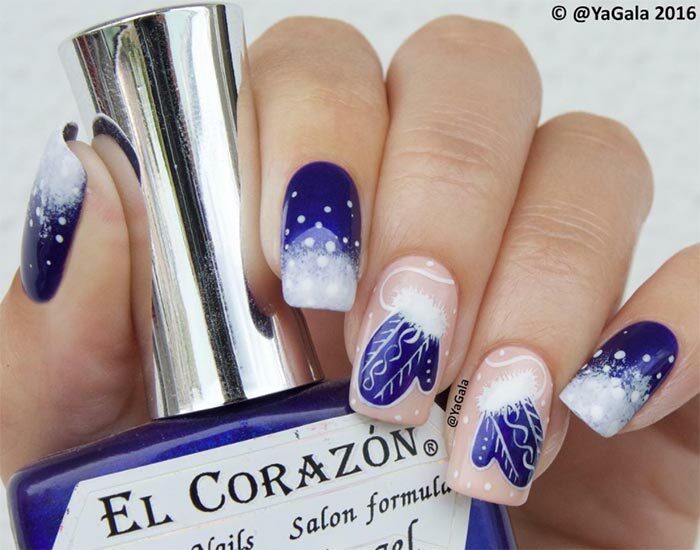 A rich blue with sparkles and snowflakes is a very holiday themed nail art design. The blue is very rich even with the thick addition of glitter in the color, but it really gives the appearance of snowflakes in the near and far view. 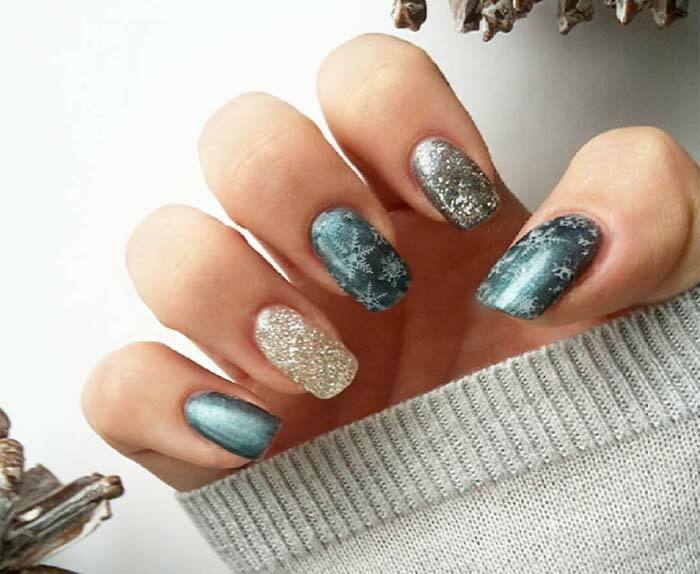 It is a very wintery look on an incredible nail shape trend. Cool colors are always great additions for Christmas nail designs, and here they use a shiny blue gel color, a glittering turquoise and a defining gold line, all of which create a sort of reverse manicure. With the shorter color being nearer to the cuticle it is an interesting take that is still really pretty. This is another favorite holiday nail design on the list; it’s intricate and hypnotic. The framing gold designs are very cool to look at and unexpected. I am sure we’ll see much more of this style in the future. The gold is a bright, shining contrast that lends a defining detail to the shining teal and blue marble nail designs. As holiday nail art designs go, a favorite style will typically include the use of silver or gold somewhere. 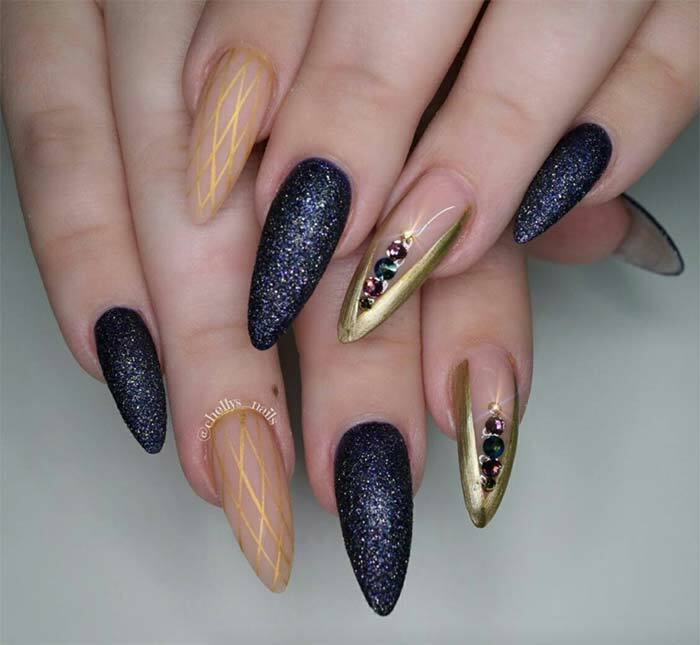 In this design, we have gold foil and gold leaf to give completely unique designs to the overall look of the manicure. The intricate white lines also give the design an upscale feel that does not take away from the holiday themed aesthetic. 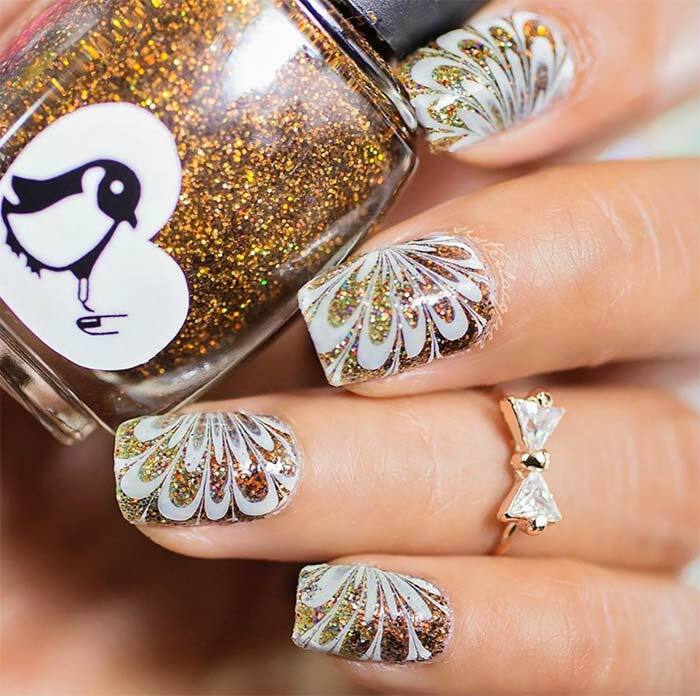 Gold leaf and cool techniques are credited as elevating this holiday nail art design. 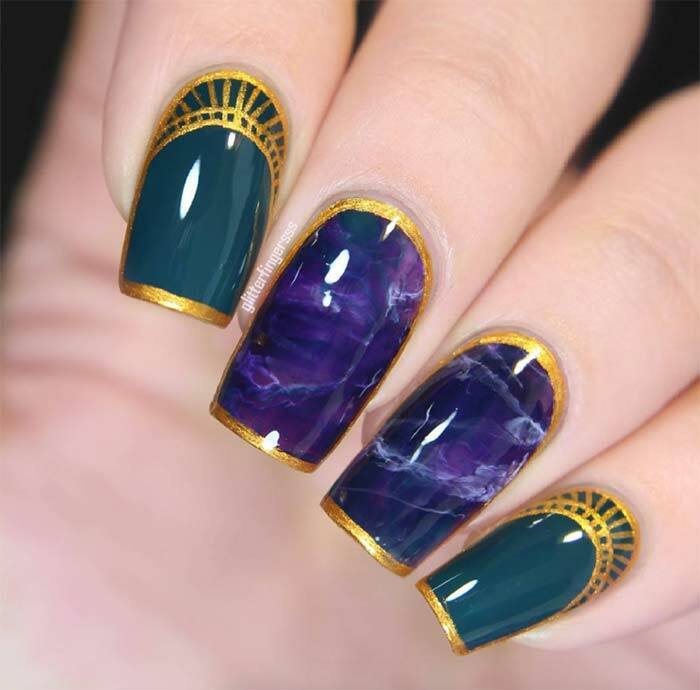 The gold leaf creates a shimmering marble appearance and accents the black and white marble nails. 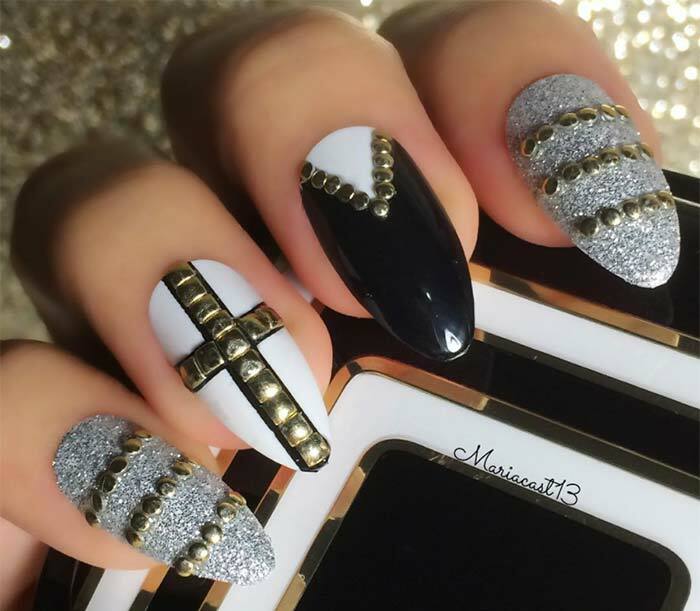 I love the tiny gold triangles that accent the black and white nail as well. 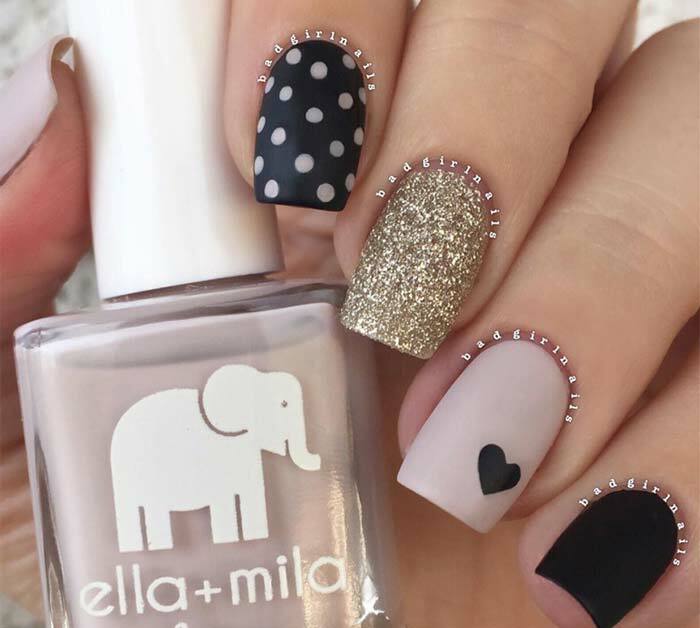 Matte gives an almost soft appearance to nail designs, and in this holiday nail art design, the polka dots and accent heart look darling. The glittering middle nail is a great accent as well, but I most love the coordination between the colors that create the overall effect. This holiday nail art combines a variety of popular trends and manages to make them work cohesively. 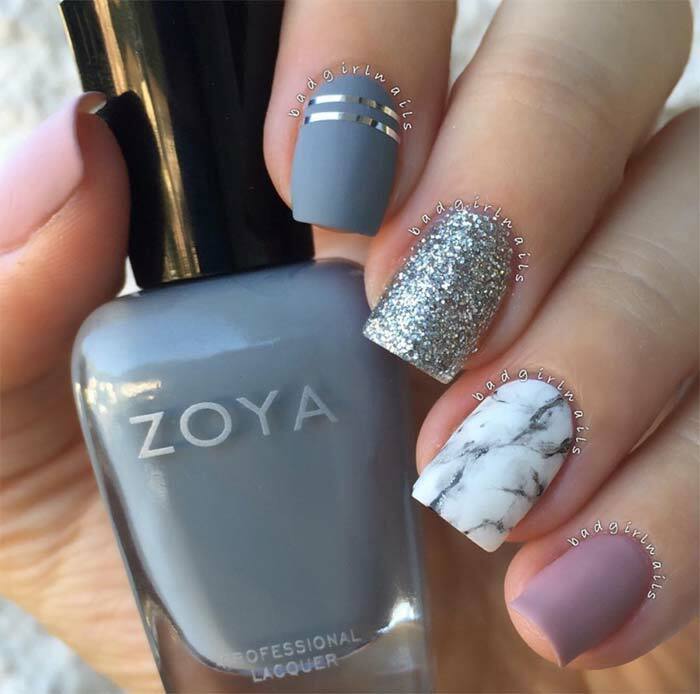 The sparkling silver glitter will always be a holiday nail art trend, but the matte grey and peach look equally good with the grey offset by lines of silver foil. Finally, the marbled nail is also really cool looking and works with all of the different accents to complement the other nail designs well. Square tipped nails, painted black and covered with silver sparkle nail polish, have a greyish appearance to them. It looks intentional and fashion forward thanks to the textured appearance and matte finish. 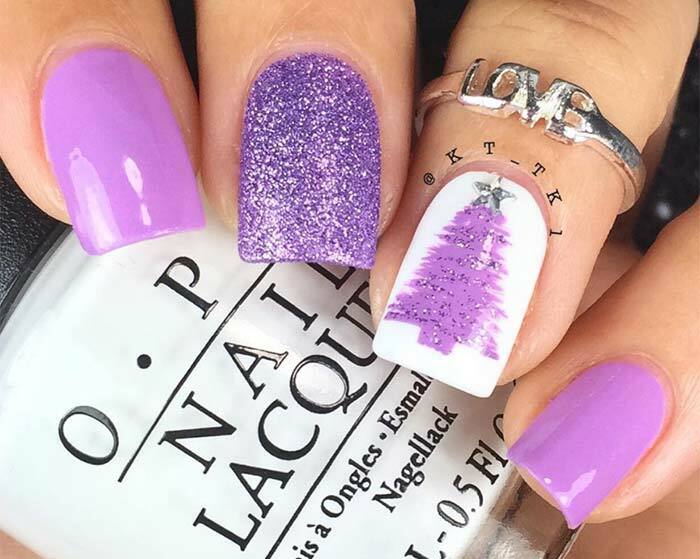 If your favorite color is anywhere near this cheery shade of purple, then this Christmas nail design is perfect for you. The color is light and cheery, but accented on the center nail with a wash of purple and silver glitter. The same glitter is used to accent the little lavender Christmas tree, topped with a silver star on the ring finger. Iridescent pink is a light and shiny background that lets the black painted snowflakes, accented in the center by a dot of silver sparkle, really stand out. The combination of holiday nail designs here works together to accent each other. The shiny black polish makes the black snowflakes stand out more, while the silver sparkles from every angle as well. 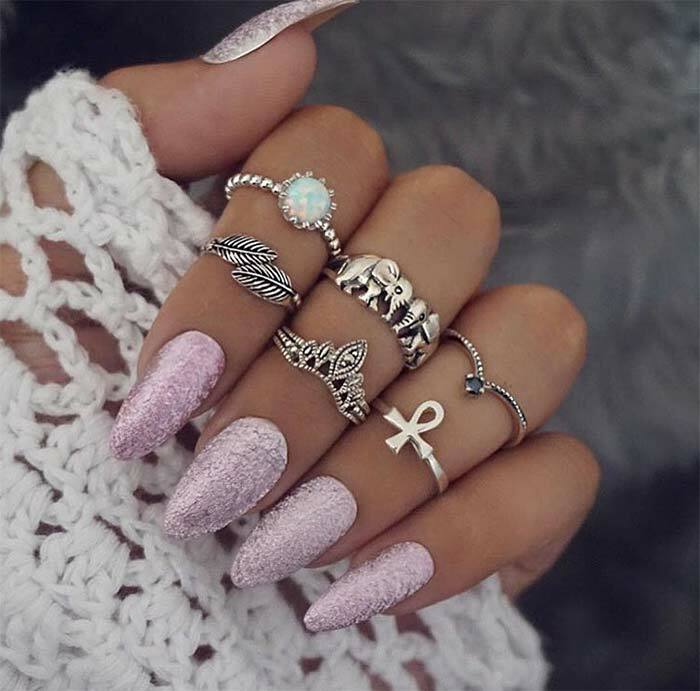 A goldmine on your ring finger doesn’t always make one think of nail polish but here it perfectly applies to the holiday nail art design. 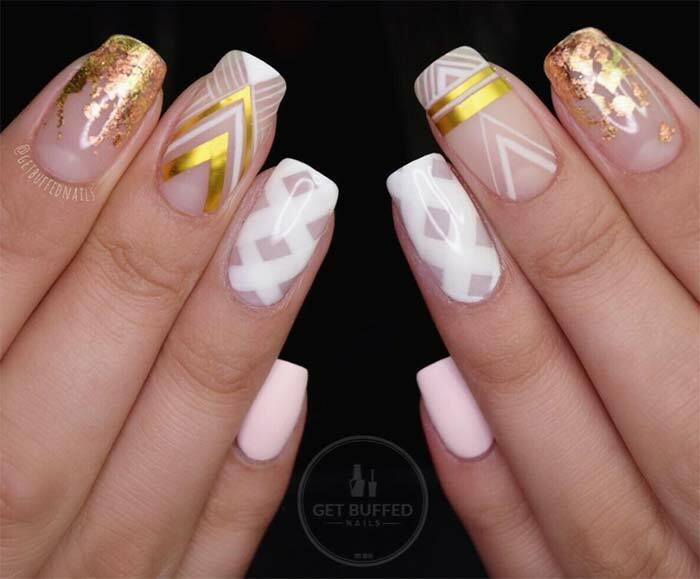 The gold triangle accents on the other detailed nails featuring line art and animal print look amazing, giving off a totally connected look. This is one of the holiday nail art designs that show off a high amount of glitter and sparkle characteristic of the holidays. The simple and classic appearance of these holiday nails is great, but the forefinger design is textured thanks to the glitter and jewels put on them. 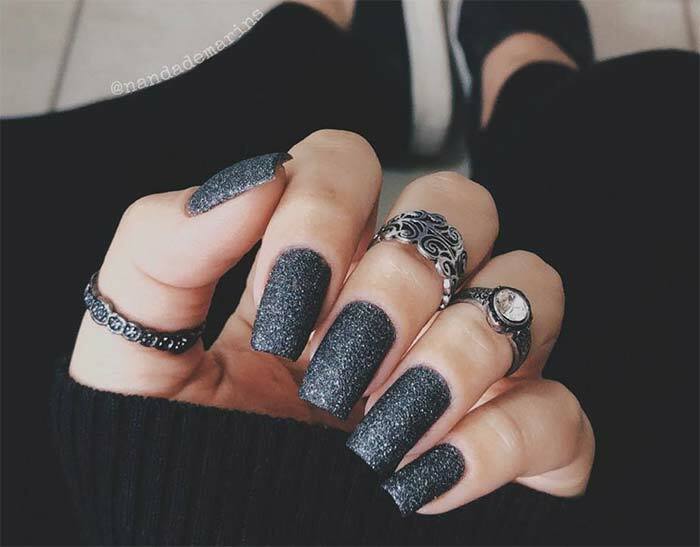 The smooth glittered ring finger nail is a great contrast from the other glitter nail and overall the look is interesting as well as beautiful. This is so cute and cool! 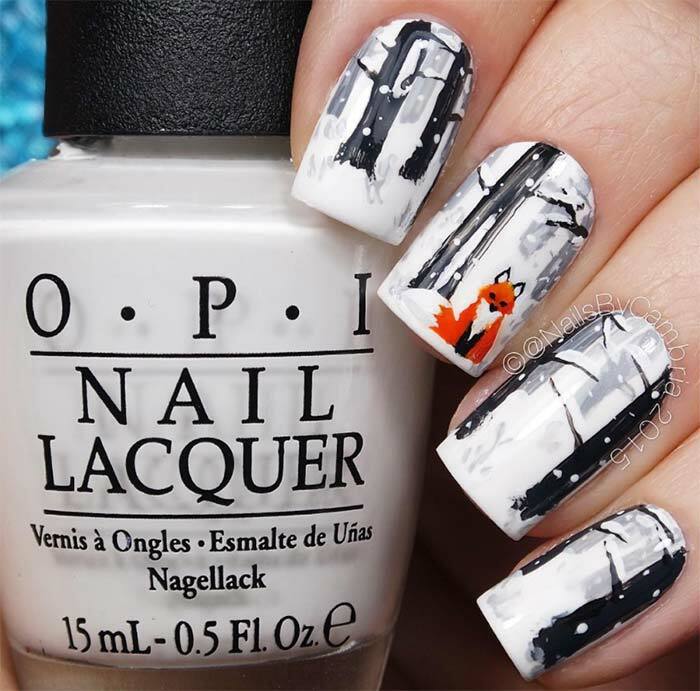 The fox is adorable and the winter scene painted on the nails is incredible. 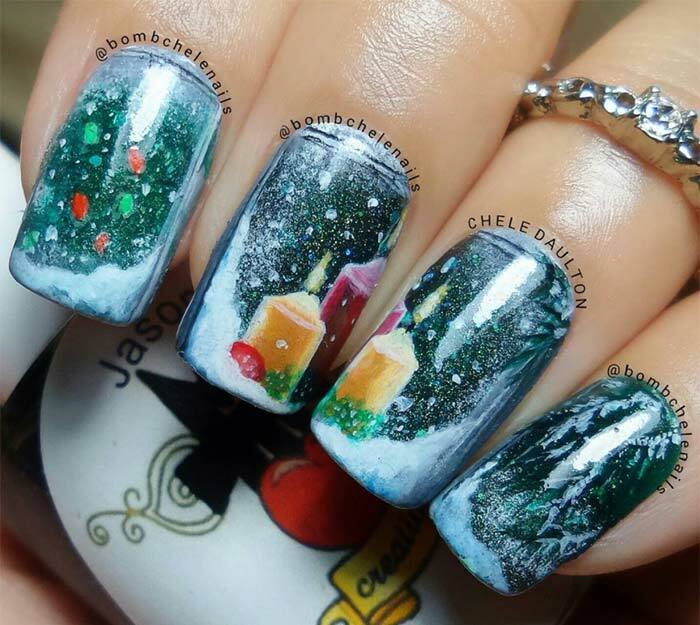 These Christmas nails are designed to be fun and artistic and they have reached that goal and surpassed it by miles of snowy forest in this holiday nail art design. 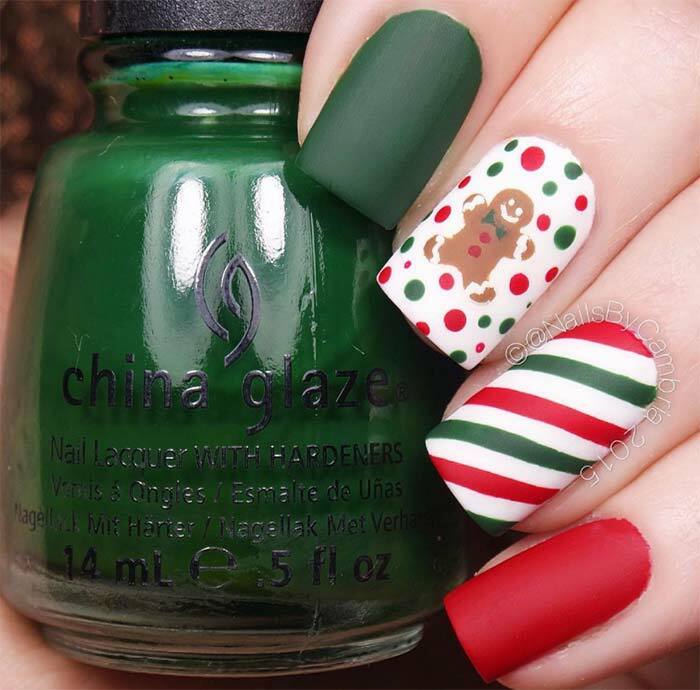 Adorable Christmas nail designs are one of the best things about the Christmas season. The ability to be festive in a minute but noticeable is appreciable and fun in a great way. 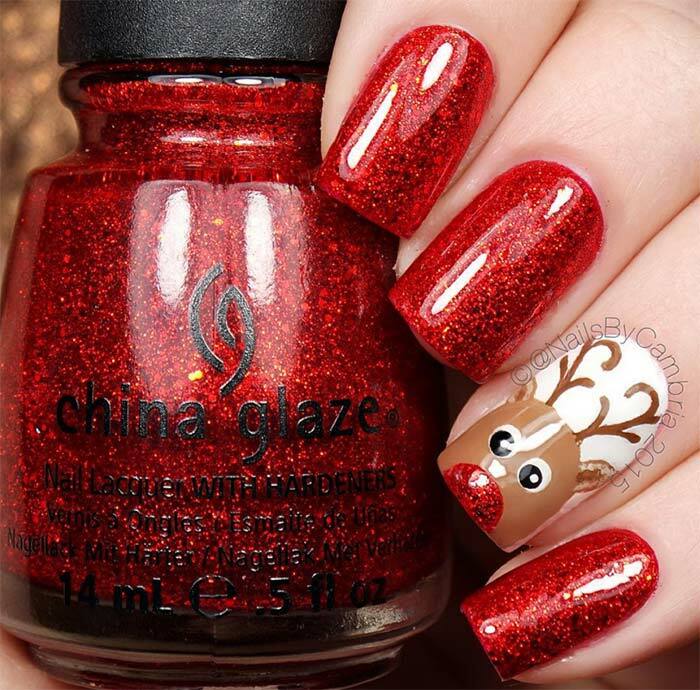 Here the sparkling red is perfect for Rudolph’s nose and the rest of her nails and the fun little cartoon Rudolph is cute and playful, peeking out of her nail. French tip manicures have a lot of different options for modification without altering the overall aesthetic too much. Here the use of a garland of holly accents the line, where the French tips would start. 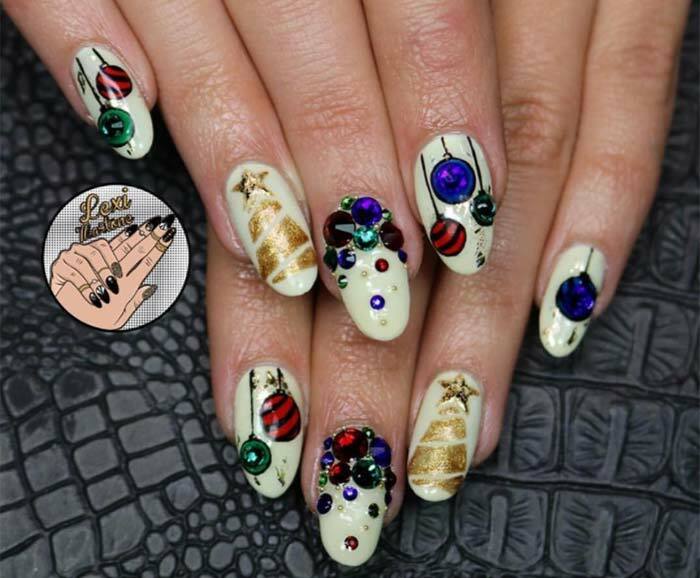 The design is nothing if not pure holiday fun and an ideal Christmas nail art design. 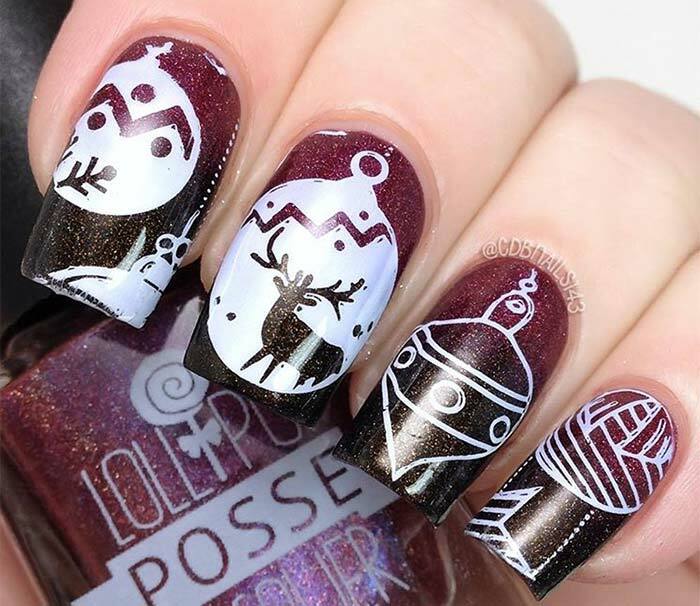 The design of this Christmas nail art is so intricate looking that it cannot be anything but impressive. The red, green and gold as well as the subtle sparkle are textbook Christmas wrapping paper themes. The nail design is completely amazing and a holiday wonder in and of itself. 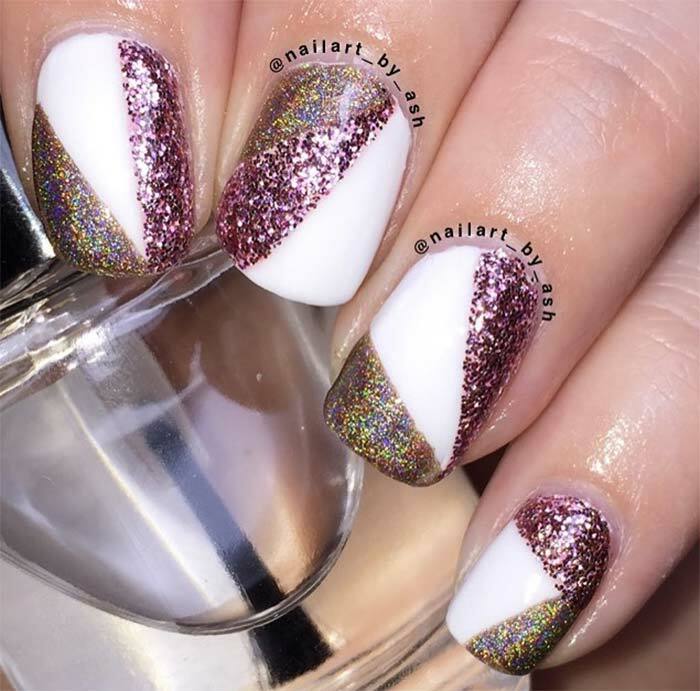 The very fall into winter aesthetic of this holiday nail art design is one of the greatest combinations of glitter nail polish and white line art. The colors bounce off of each other accenting the design perfectly and the multitude of colors in the glitter as well. 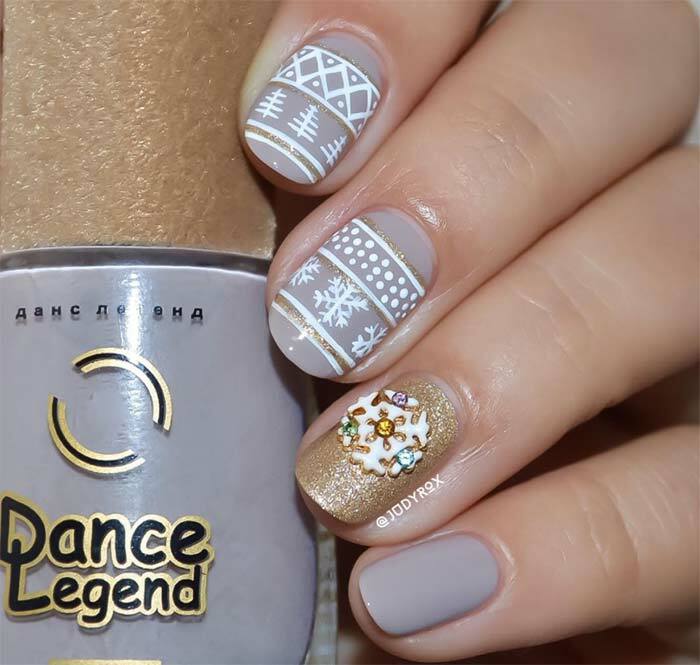 This holiday nail art design takes several steps to complete, but it is an absolute work of art overall. The green ombre and white really complement each other well, allowing the floral design to stand out as well. So many factors contribute to how beautiful this holiday nail art looks overall that it is hard to know which feature to start with. First the line art is amazingly detailed and accented beautifully with well-placed prismatic stones of various sizes. Next are the pearlescent pink pinky nails that shine from every angle and finally the center nail, covered in pink and gold toned glitter, really brings the look together. This is a Christmas nail art design without worrying about the perception being incorrect. The gingerbread man is adorable, the entire set of nail designs being matte and clear. It’s a fun little design and a Christmas nail art option that is delightful. 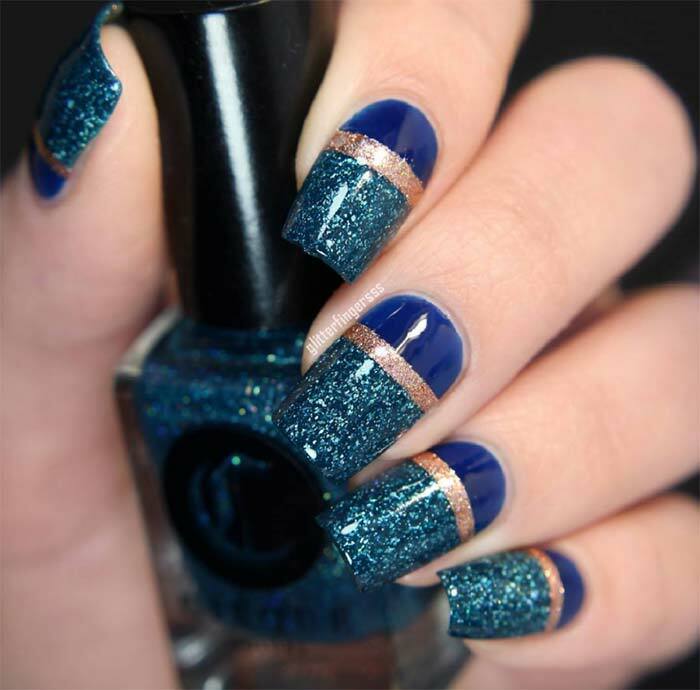 These stiletto nails are everything with a deep blue background detailed with multidimensional glitter. The notice centered on the gold designs that include stacked stones and gold lines are pulled along the design with intricate placement. 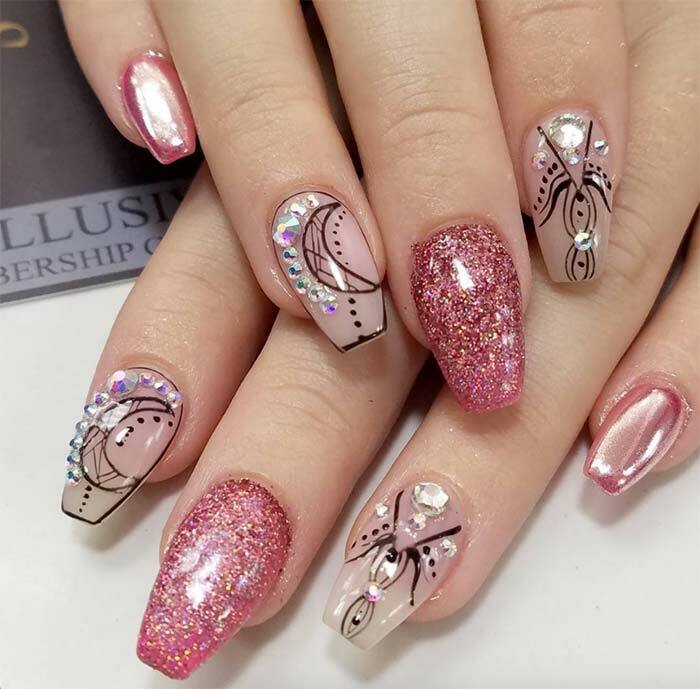 Nail designs are incredibly varied and these holiday nails are encapsulating several different looks at once without affecting the actual texture or outside appearance of the nail. Here sparkles are included with actual glitter in amazing designs, while the ring fingernail is finished off with pearl and gold details. The black really sets off the gold, white and jeweled accent perfectly. The use of textured manicures is becoming more popular again and the designs are getting more varied. Here the Christmas tree is done in little shiny pearls and topped with a gold star. 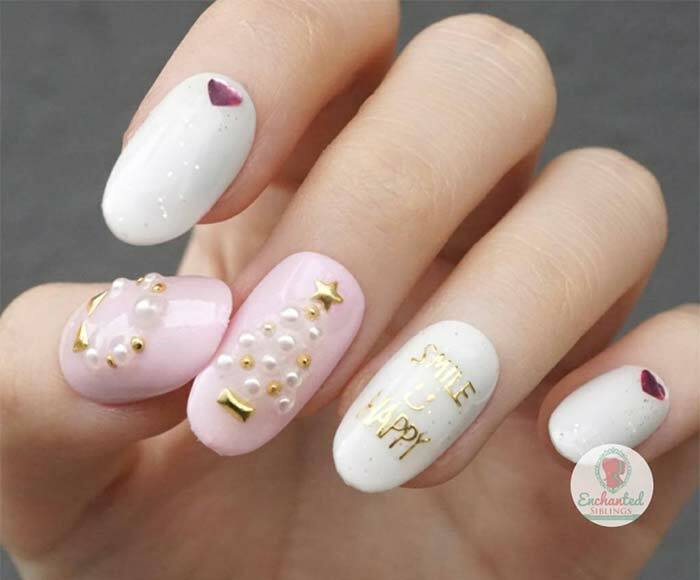 Each of the other nails features a design from a small gem at the base of the nail as a reminder to smile and be happy on another. The design most often seen on the typical holiday sweater is put in white over a glittery pink base coat. The additional of gold-foiled reindeer is incredibly sweet, and the tastefulness of the piece is obvious. 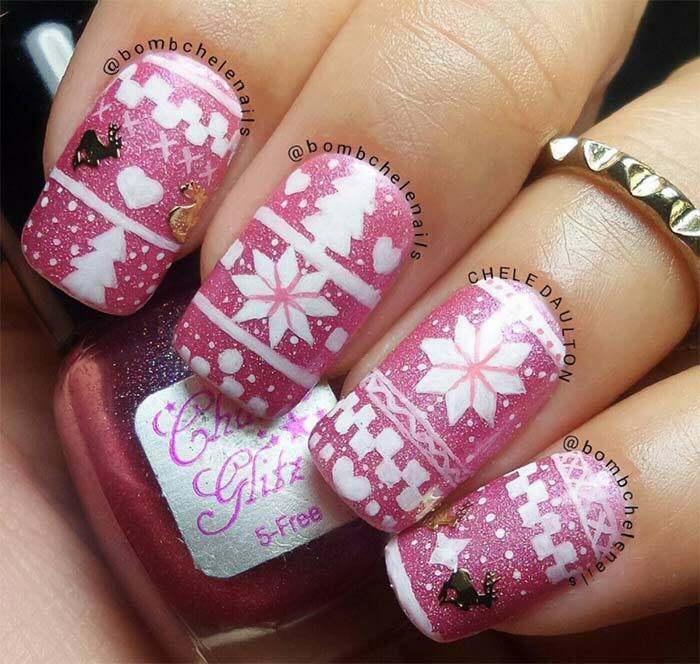 This is a stunning display of artistry in Christmas nail art design. 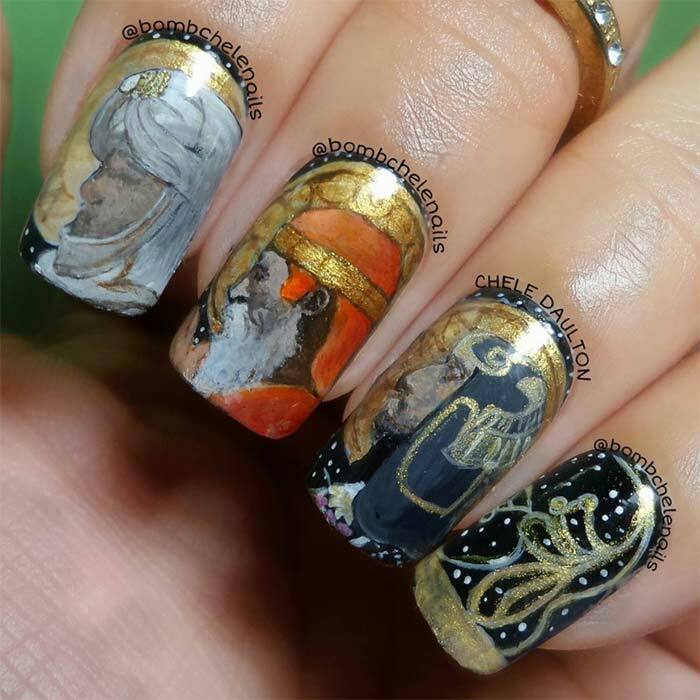 The three wise men appear to be depicted on the nails and the final touch is the pinky nail, beautifully done, and the greatest details don in shimmering gold. 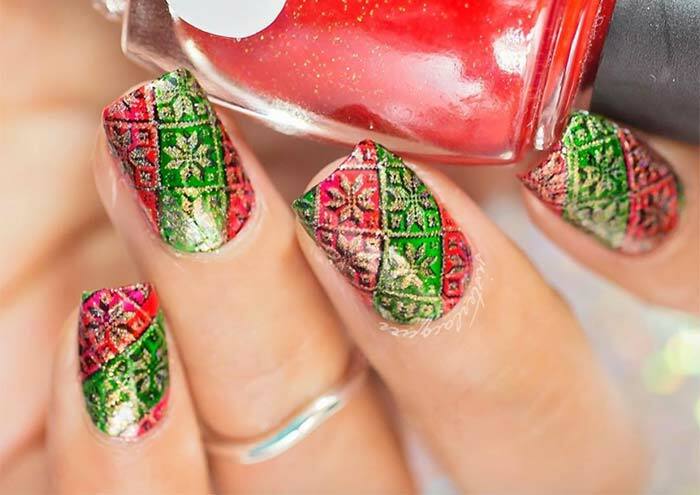 The highly detailed design of these holiday nails show an amazing amount of Christmas features in the design. There is a decorated Christmas tree with red and green lights, snow and ornaments and even lit candles! 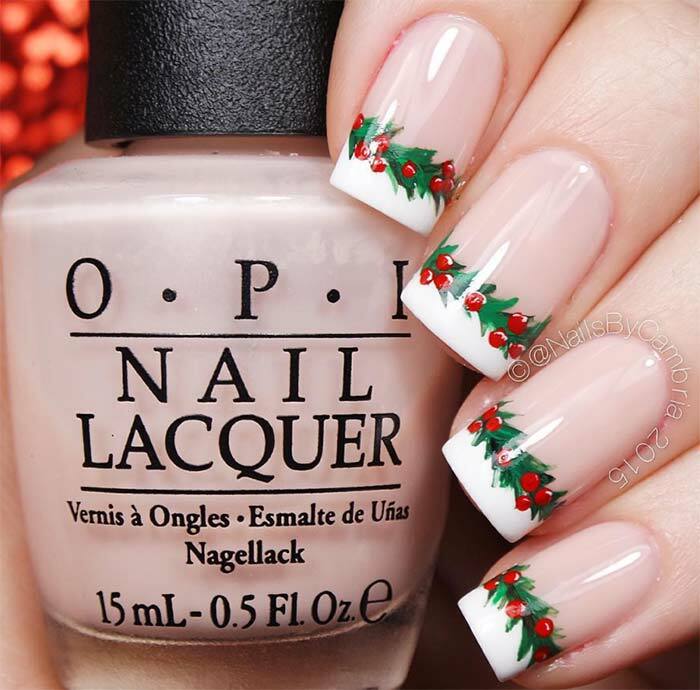 These nails are beautifully well done and show off an ideally designed Christmas nail set. This holiday manicure has a simple aesthetic with a cute little cartoon owl sitting on a branch on the ring finger nail. The gold details on each of the other nails are interesting as a minute detail, and although they are nearly the size of the painted owl, they don’t really compare. A sparkly fuchsia purple background is a beautiful space backdrop or the constellations and astronomical signs. 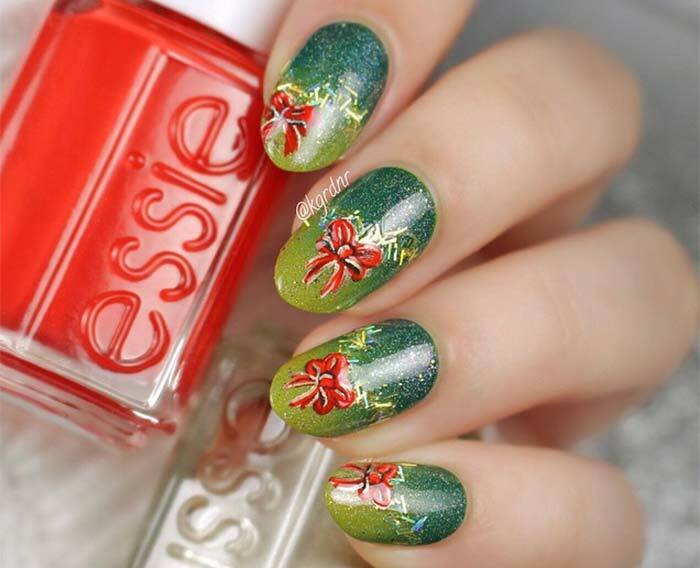 It’s a great holiday nail design idea and well done in bright colors and definitely with a steady hand. Green ombre is the background for a bright red holiday bow. The bow is highly detailed, and the sparkle embedded in the nail colors is subtle but still manages to be clearly seen. 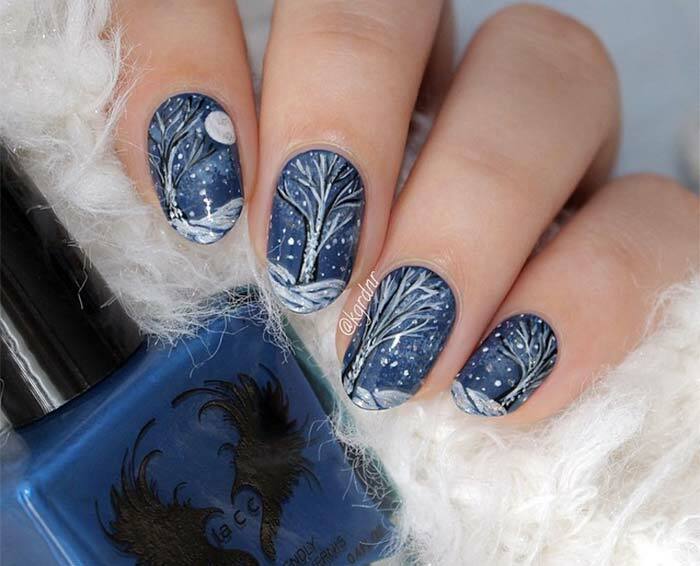 Smooth blue nail polish provides the background for a nighttime winter scene complete with a bright full moon. 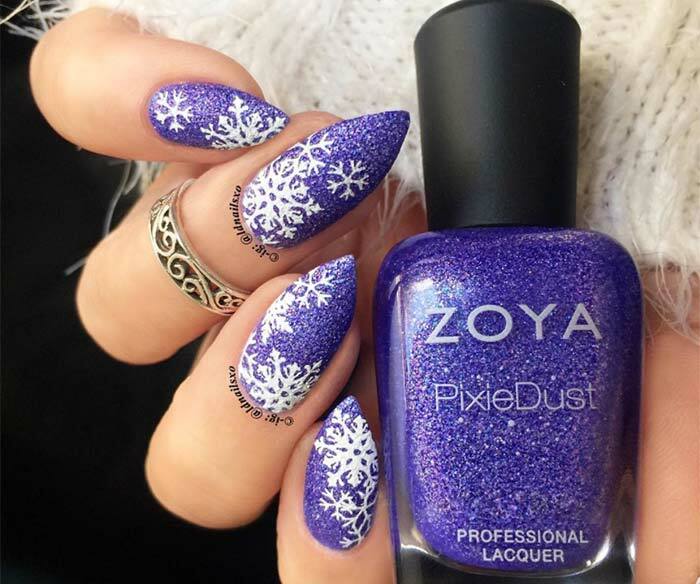 It’s an amazing snowy holiday scene that makes for a perfect holiday nail art design. 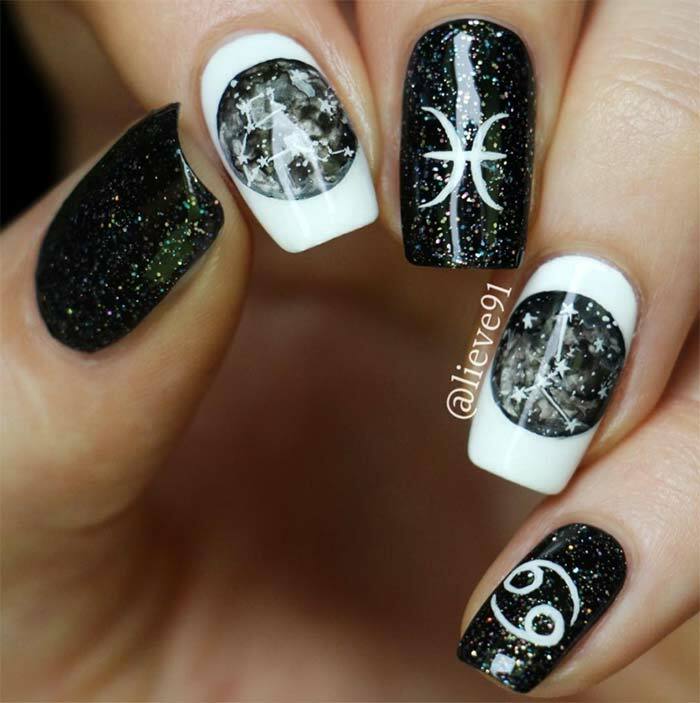 The constellations and signs are intricately painted over a shiny and sparkly black nail color, as well as a stark white. This is great detail work, especially the constellations! Deep, darker matte magenta shows as a great end color for the thumb and pinky ring fingers. 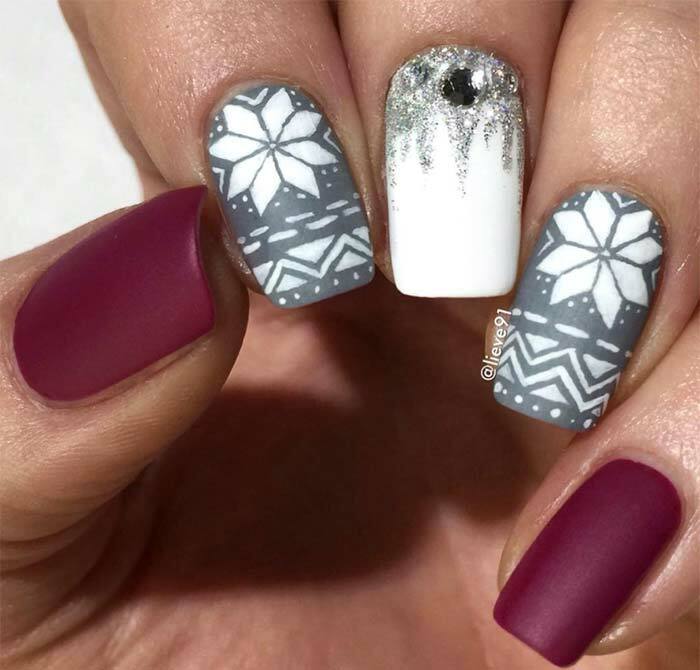 The real surprise is the snowflake icon found on most winter-style clothing done in white over gray, and in the center nail we have a sparkle of rhinestones, while you’re still in the shape of a look or more likely it is a holiday request. 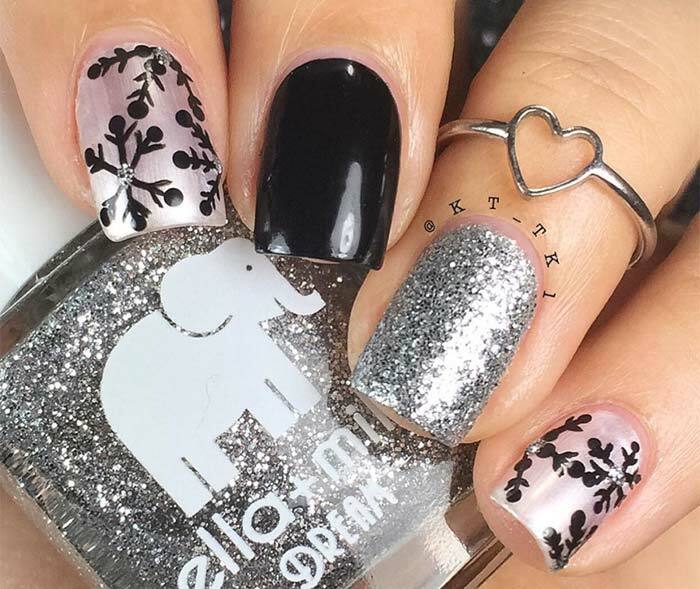 I love how the stark depths of black can really offset designs, both as a background color as used in this holiday nail art design for the reindeer and design of the little hearts polka dotted along the pinky finger nail. 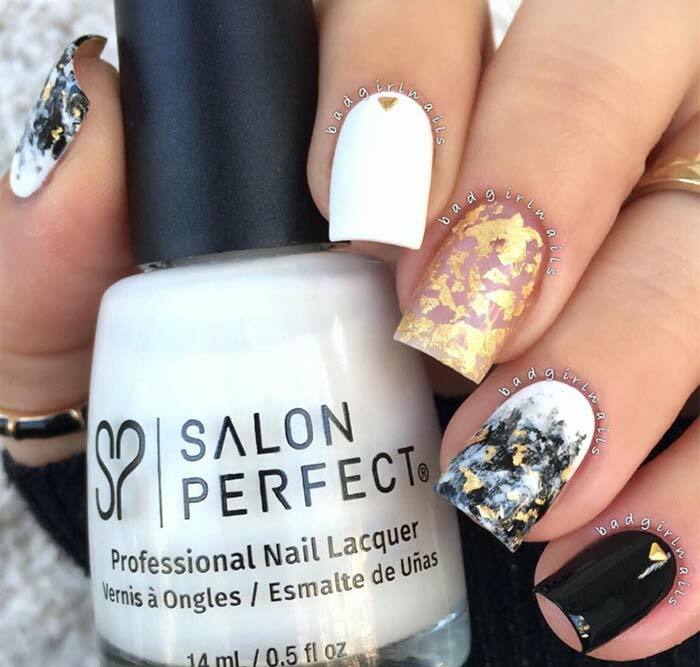 Holiday sweaters may easily trip into the ‘ugly sweater’ category, but on holiday nails the patterns are appreciably cooler, transforming an ordinary shade into something incredible with the use of just white and gold details. On the ring finger nail is a three-dimensional snowflake, accented with gems over a nail base of glittering soft gold. 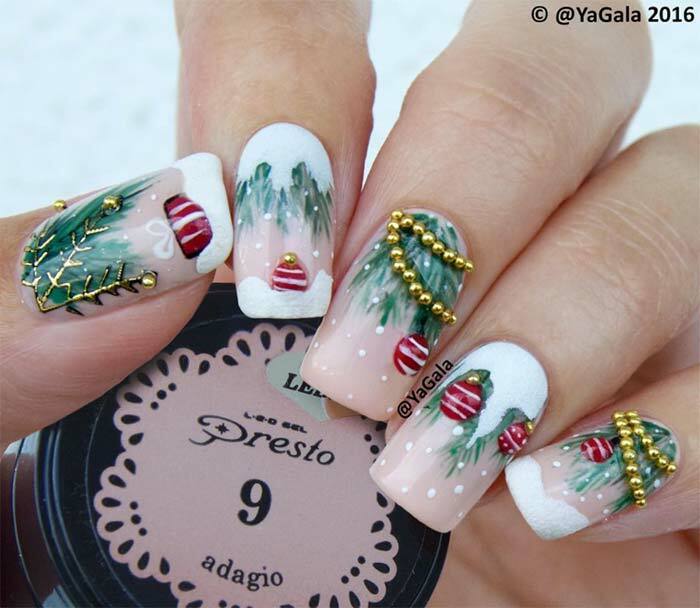 Three-dimensional holiday nail designs offer more than one interesting element to the aesthetics of any Christmas nail art design, but the details that show the ‘trimmed tree’ like the golden garland or the little red ornaments and gift are incredibly cute. The gold bead accents on the snowflake and at the top of the ornaments are subtle and a very nice touch. 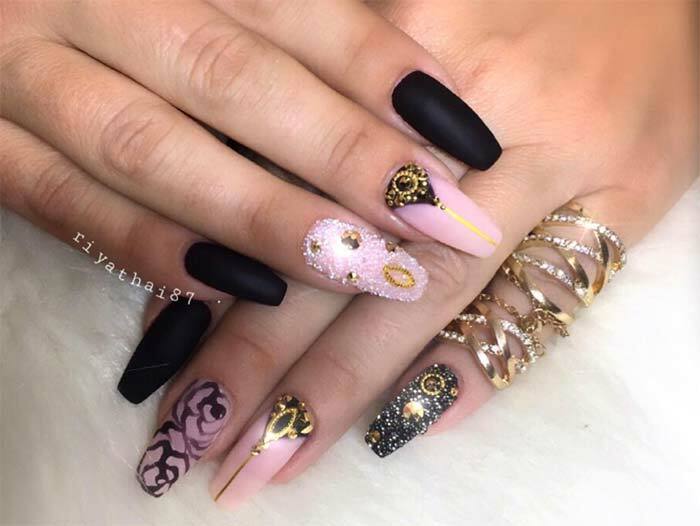 Matte black coffin nails are interesting in how they are dark yet alluring, but here they are used to offset the richness of the designs on the other finger nails. The use of gold intricately plays a part in how amazing these holiday nails really are. 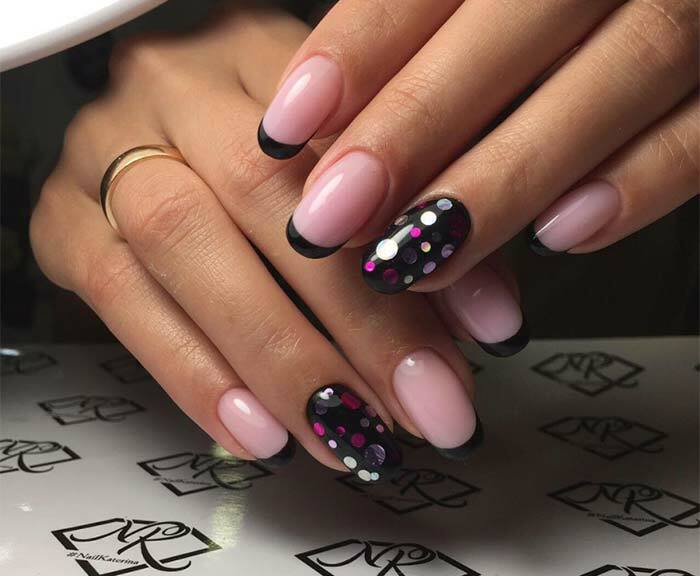 The soft pink color, treated with painted-on roses, black triangles at the base accented by gold and lines and even the textured glitter and jewel encrusted nail, make this a great set to show off at any holiday party. 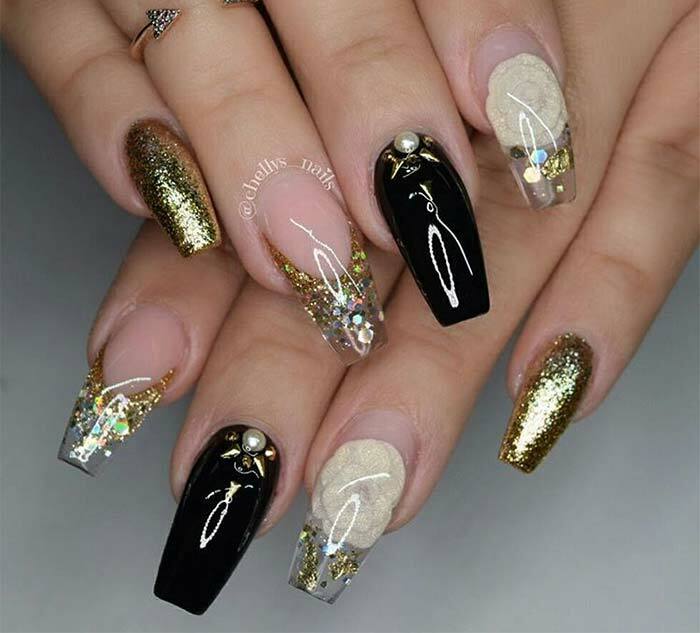 This may seem like a simple option, but the perfection in the shape and amount of gold applied to the holiday nails means meticulous attention to detail and a very steady hand. 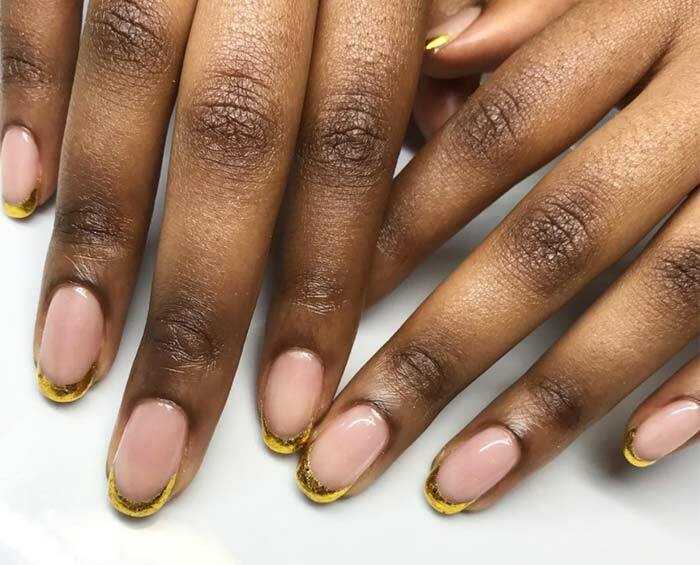 Golden tips of natural color nails make a great look and one I think would be very cool to try. 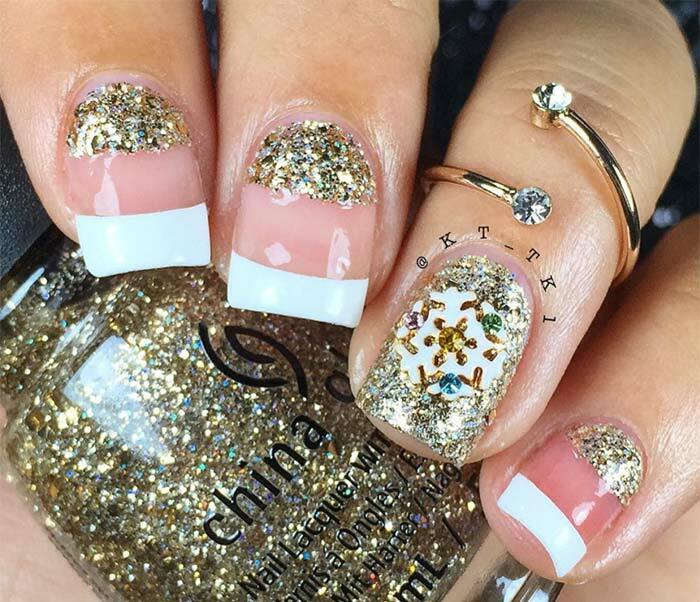 As previously mentioned, glitter is one of the most easily sought out features when it comes to holiday nail designs, since everyone wants a touch of sparkle. The geometrically applied triangles of glitter are interesting and prominent, appearing like a cross between rays of light and expensive wrapping paper. 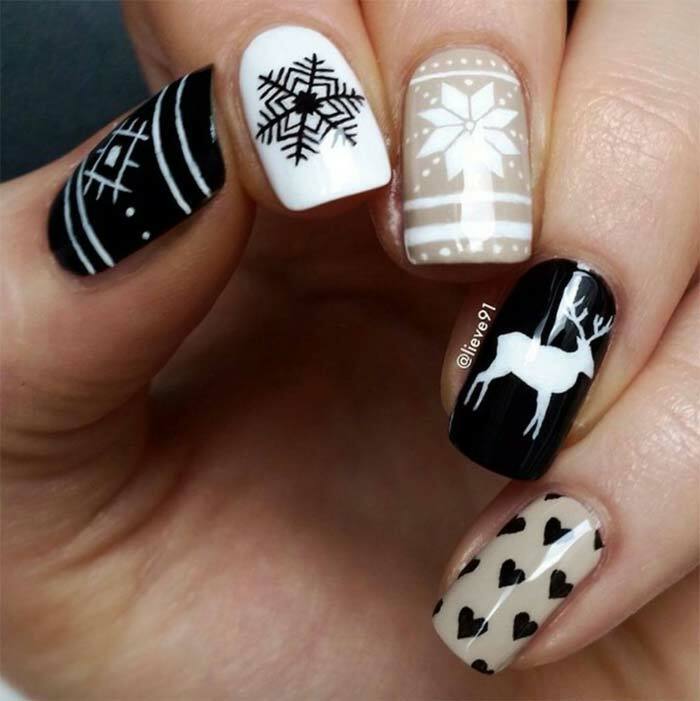 The most iconic winter holiday print is the snowflake and imprinting them on the nails is one way to create a great holiday nail art design. The accent colors here are both silver and gold, which show up separately on the forefinger nail and the ring finger nail. Black nails are my favorite when going for a single color, but here the surprise of the gold nail and the even more unexpected pop of pink on the middle finger nail make for a more interesting holiday nail design indeed! Teal and purple are popular colors normally and here they are a muted shade. 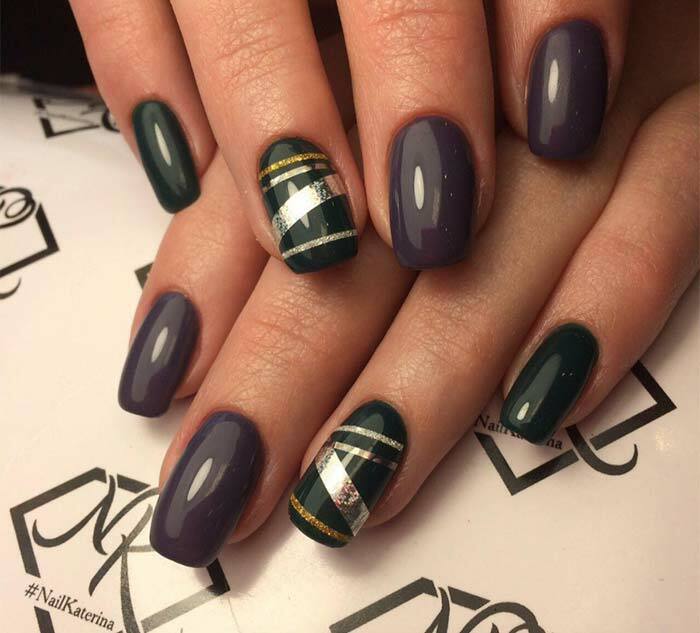 In this minimalist and chic holiday nail design, the teal color features silver and gold foil lines in varying sizes both straight and diagonally. Pink nails accented with a thin black tip are boosted by a shiny polka-dot-treated ring finger nail. This holiday nail art has a lot of pop to it, and the colors are light and fun with the mirror like colored polka dots. Red and green pearls and jewels are coordinated to match and decorate the ring finger nails of each hand and they sparkle on a base of silver. The other nails show of a half moon based manicure that only helps to boost the three-dimensional ornamented holiday nails.